This was one of my Dad’s favorite desserts. I did not have the pleasure of making it for him, but my sister Diane made it for him frequently. 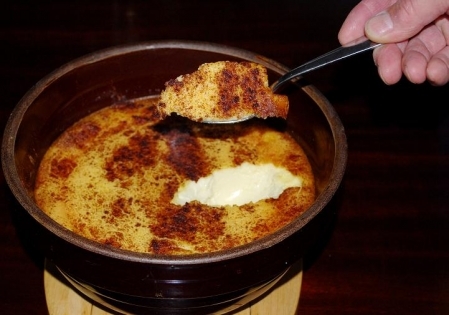 It basically is a crème brûlée served family style without the caramelized sugar and uses the whole egg as opposed to just the yolks. The bowl shown is exactly the one that it was made with. I hope you enjoy it as much as he did. This is dedicated to his memory. In a medium sauce pan, heat cream and vanilla over medium low heat. Stir frequently until warm and vanilla has infused into the cream about 20 minutes. Do not boil. Let cool for about 15 minutes. Cream mixture won’t be completely cool, but slightly warm to the touch. Whisk periodically to prevent skin from forming on top. While cream is cooling, in a large bowl beat eggs and sugar. After milk has cooled, slowly whisk in part of the cream mixture to the egg mixture and then gradually add the rest. Using a large oven proof bowl or casserole dish pour mixture through a fine sieve into the way bowl. Pouring through a fine sieve is important, because it will catch any lumps. My sister did not do this, but I think that is important. Bake in a preheated oven at 325 degrees for about 1 hour and 10 minutes. Let cool for an hour at room temperature and serve family style. Dad preferred his slightly warm. However, you can refrigerate and serve chilled too.